Don't spend countless hours searching for the perfect table decorations! Now all the table decorations you need are in one convenient package! This Barbie Decorating Kit is the only thing you need to take your tables from boring to beautiful. Each kit includes three centerpieces: one large centerpiece, measuring 12 1/2 inches decorated with Barbie herself, and two smaller centerpieces, measuring 7 inches and each decorated with Barbies best friends. 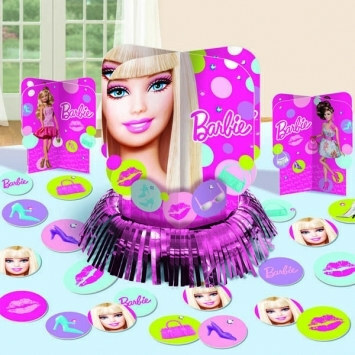 The set even includes 20 pieces of confetti decorated with Barbie's favorite accessories.